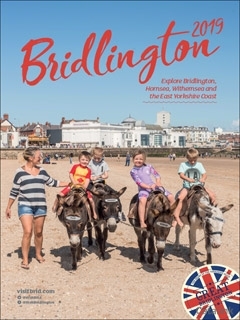 To order a printed copy of the Visit Bridlington brochure, simply click the Request button below. View the Visit Bridlington Online Brochure Now! No trip to Bridlington is complete without visiting the seaside! Treat the kids to donkey rides along the beach or sail out of the old harbour in a pirate ship, the choice is yours. The land train is also a great way to see the bays and even goes all the way to Sewerby Hall & Gardens. Bridlington's Old Town is a must-see if you enjoy culture and architecture, uncover the beginnings of the town at the Bayle Museum where you'll find the old courtroom and 17th-century criminal documents. The Priory Church also boasts impressive architecture and hosts regular events. With miles of dramatic coastline and natural spaces there's plenty of opportunity for leisurely walks or adventurous trekking. Bike along the East coast for dramatic views or explore further for the golden beaches of Withernsea and Hornsea. Request the Bridlington Brochure today for inspiration on the trip of your lifetime! Enjoy a Great Time Anytime on Devons Beautiful Bay. Whatever the time of year, the award-winning beaches, unique attractions and stunning coastline make for days out of this world and nights to remember. dealchecker.co.uk is a totally FREE & independent travel website that helps you find the best deals on the web. Every week their travel agents hand pick the best 20 travel deals around & send them FREE to your inbox! Every deal is thoroughly researched to make sure that its a real bargain! By pressing the Request Printed Brochure button you give consent to Visit Bridlington (and their Data Processors for the specific purpose of delivering your literature) to send you their Brochure .